The BOND IS PAID on this IMMACULATE 3 bedroom, 2 bath EXPANDED Designer CYPRESS, in the VILLAGE of SANTIAGO! The home offers a beautiful, neutral dcor with VOLUME ceilings, and DIAGONAL TILE flooring throughout (carpet in 3rd bedroom only!) The addition of a SPACIOUS FAMILY ROOM, makes this 3 bedroom, 2 bath home one of a kind! The spacious kitchen features warm wood cabinets with pull-outs, electric range, and newer side by side refrigerator and a space-saver microwave. An abundance of cabinet space, and a sunny breakfast nook complete this bright space! The spacious living and dining rooms are enhanced with custom window treatments, including REMOTE CONTROLLED BLINDS! The master bedroom offers TWO WALK IN CLOSETS and a master bath upgraded with BOWL SINKS, a vanity, and a JETTA STONE shower. The guest area features two comfortable bedrooms (both with closets) and a guest bath with a tub/shower combination. The ENCLOSED LANAI has a heat/air vent and a peak of the golf course behind! The lanai is accessed through sliders from the living room and the guest bedroom! The exterior of this CORNER LOT home is as beautiful as the interior with a TEXTURED drive, STACKED STONE planting beds and lush, Florida plantings. There are so many enhancements throughout this home including a NEW ROOF, a WHOLE-HOUSE GAS GENERATOR, lightening deterrent system, and a coat closet in the entry! 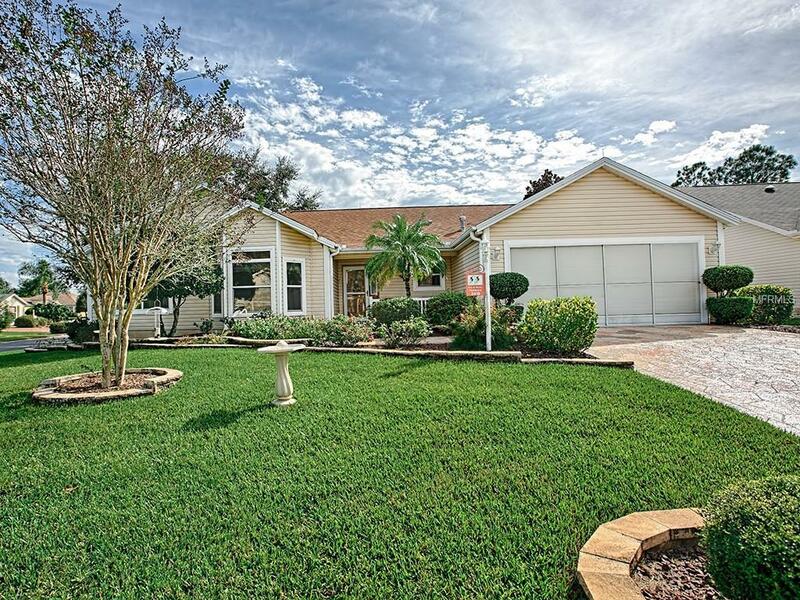 This is a lovely, CHARMING home located in a super convenient location within The Villages!